There has been a Significant Name Change to a hill that is listed in the Y Pedwarau, and the following details are in respect of a hill that was surveyed with the Trimble GeoXH 6000 on the 18th August 2015. Y Pedwarau - These are the Welsh hills at and above 400m and below 500m in height that have 30m minimum drop. The list is co-authored by Myrddyn Phillips and Aled Williams, and the introduction to the Mapping Mountains publication of this list appeared on the 30th January 2017. The hill is a part of the Mynydd Epynt range, which is a group of hills situated in the south-eastern part of mid and west Wales. The hill is positioned between the small communities of Merthyr Cynog to the west north-west and Lower Chapel to the east south-east. The hill appeared in the 400m P30 list on Geoff Crowder’s v-g.me website under the partly invented name Pen Gaer Fach, with an accompanying note stating; Name from summit hillfort. During my early hill listing I thought it appropriate to either invent a name for a hill, or use a name that appeared near to the summit of the hill on Ordnance Survey maps of the day. My preference was to use farm names and put Pen, Bryn or Moel in front of them or as in this instance, use the name of the summit hillfort and add the word Pen. This is not a practice that I now advocate as with research either conducted locally or historically an appropriate name for the hill can usually be found. 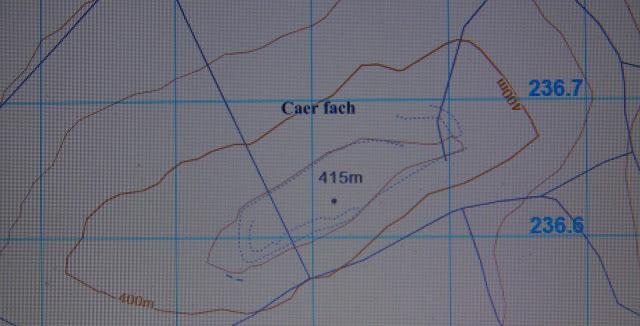 As an appropriate name for this hill already exists on contemporary Ordnance Survey maps; Gaer Fach, the invented and prefixed word of Pen is wholly unnecessary and therefore the name this hill is now listed by in Y Pedwarau is Gaer Fach. 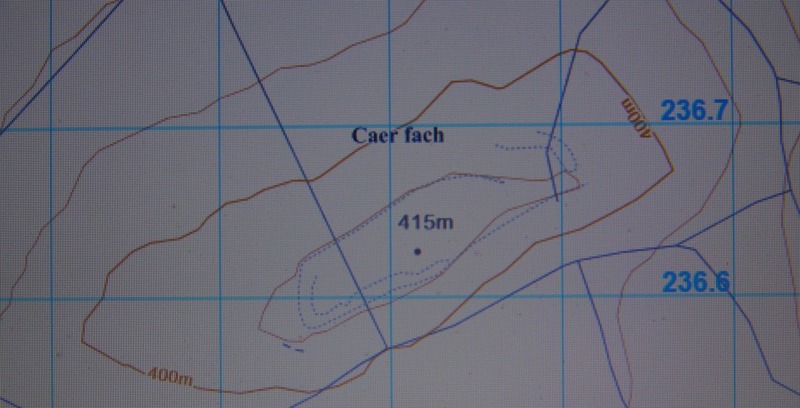 Please note, the current Ordnance Survey enlarged map hosted on the Geograph website gives the composition of this name as Caer fach, in this instance it is appropriate to use Gaer with a ‘G’ and Fach with a capital ‘F’.